If your roof has black streaks, debris, mold and mildew, black or green algae growth, or even moss and lichen growing on it, Diamond Jim’s can professionally clean it for you and extend the life of your shingles and shakes. We use a low pressure cleaning system, sometimes referred to as “soft” washing to clean your roof and eliminate the unsightly and sometimes unhealthy algae, mold and mildew. Moss and lichen grows into the shingles like the roots of a plant. This degrades the roof and creates a way for water to enter. 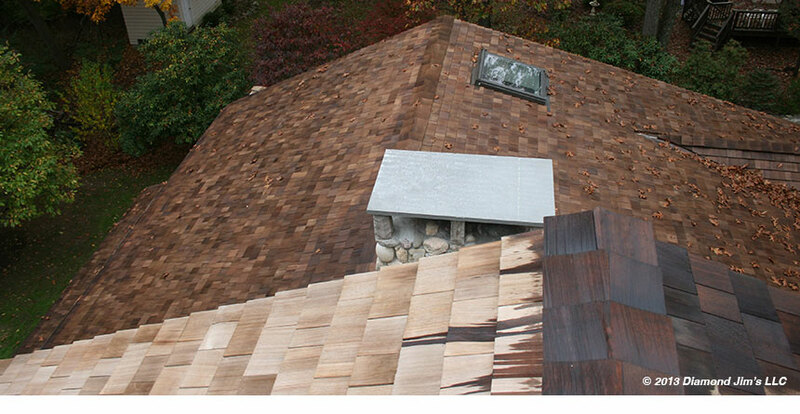 It will loosen the granular material of the shingles, it can even lift individual shingles. It’s important to remove moss as it does a lot of physical damage to your roof. Black algae (usually gloeocapsa magma) and many types of green algae are a common unsightly problem on the rise in the last 10 years. It is thought that the fillers used in shingles, and the addition of limestone which causes water retention is the cause of the increase. If the black or green streaks on your roof occur on the northern areas, or under shaded spots then it is most likely due to either or both of these organisms. There is a debate over whether this is harmful to the roof or merely cosmetic. Mold can grow on on all surfaces outside including the roof. It is unsightly, but it shouldn’t cause a health issue unless it is inside the home, in which case it should be removed immediately. All these organisms will make your roof slippery if you try to get up there to clean it. It is best to leave that to a professional. It’s a sound investment to clean your roof as it will lengthen the life of a roof. Replacing a roof can cost thousands of dollars so extending the life of a roof makes sense. Before you take that step of replacing a roof, give us a call for a free cleaning estimate. We’ll tell you if your roof truely needs to be replaced, or if a thorough cleaning will give you more years. 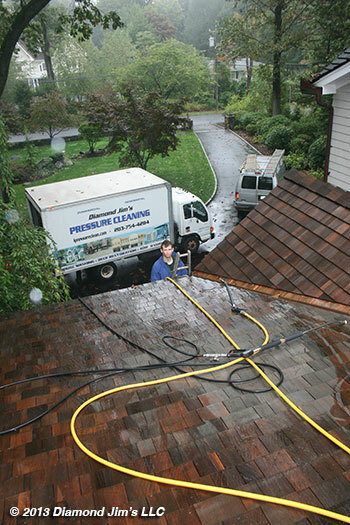 Be wary of unexperienced pressure cleaners as a roof needs an experienced person cleaning it. A roof should never be washed by using high pressure as it can damage it, many fly-by-nighters will use high pressure to blast it clean only to leave you with worse issues later. Read our blog post on “What Everybody Ought to Know About Roof Cleaning”. Not all roof cleaners are professionals. Unfortunately, because of the economy many roof cleaners have popped up as these individuals think that for the price of an ad and the use of a cheap machine they can go in business. I clicked on an ad for roof cleaning in my area only to see new roof cleaning business using photos ripped off from my website. Please, when getting your home or business quoted go with someone reputable, ask what equipment they have, ask how long they have been in business, get their insurance certificate. Realize you cannot guarantee a roof cleaning, spores from these organisms will land on your roof with the next wind and start to grow again. It will naturally take organisms a few years to build up as that’s the natural cycle of things, not some magic potion they’re using. I know of “roof cleaners” who are saying they guarantee your roof for 5 years when they’ve been in business for less then three. I’ve been working in your area for 28 years, if I see something wrong I fix it, but these newbies making ridiculous claims and using scare tactics regarding your health have just got to stop. Click on the photo gallery below to see my work, the first photo was the one stolen off my website from a competitor that was quoting the same jobs as me. If you are in need of roof cleaning for asphalt or cedar shakes in Connecticut, call us today at 203-558-0968 or complete our online form.